An update to BS8599-1:2019 means that new BSi first aid kit rules are in force. 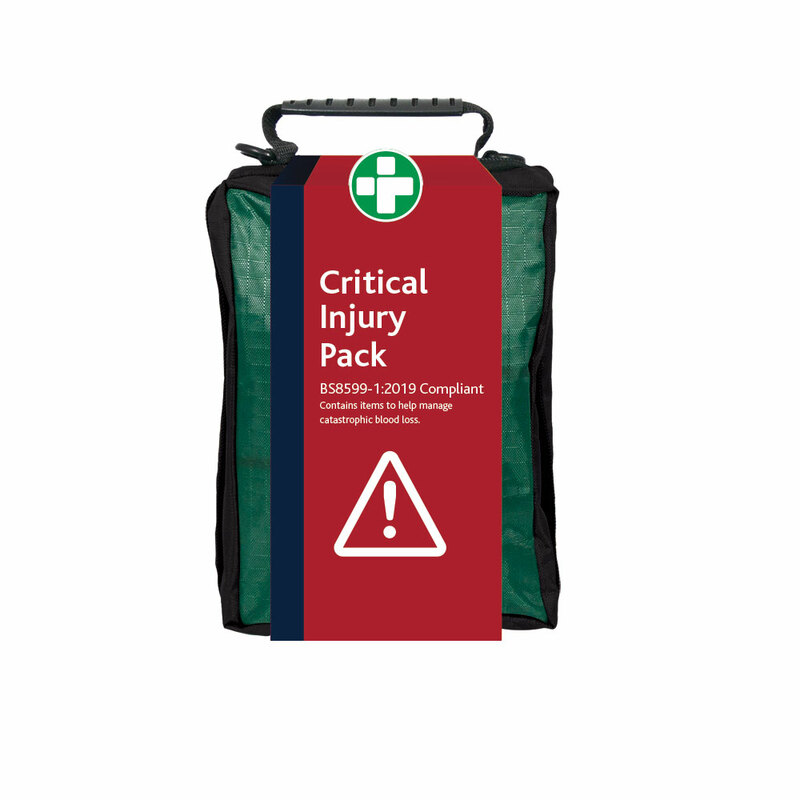 There are two new additions – a ‘critical injury pack’ for a severe life-threatening bleed or mass-casualty attack, and a new ‘personal first aid kit’, ideal for those lone-working and outside of the office. Minor other changes have been made to the small, medium and large workplace and catering kits. Every second count when dealing with a catastrophic bleed and action needs to be taken before emergency services arrive. This can make the difference between life and death. Currently, standard first aid kits aren’t equipped appropriately to stem such a bleed. The HSE now recommends that employers provide haemostatic dressings and tourniquets in their first aid kits, where it’s possible that trauma could occur. The new kit should be carried by the person at risk, so it’s at hand when needed. Appropriate training is also important, so they know how to use it! The HSE recommends that employers arrange training for staff where tourniquets and haemostatic dressings are provided. A suitable course covering this would be our Catastrophic Bleeding course, which can be taken as a video online course or a classroom course nationwide. For more information click here. We also offer a course that covers more emergency situations which can also be taken online or face to face nationally, visit our Major Injury Trauma course. Another use for the critical injury pack is at a mass-casualty incident, like a terror attack. The kit can be deployed using a ‘drop and throw’ method ensuring there are suitable provisions to stem catastrophic bleeds for anybody affected. As Paramedics aren’t able to engage when they arrive at a possible terror incident until it has been declared safe, being able to treat ourselves and others are so much more important. Large bleeds need immediate treatment, or death is a real possibility. The packs can be readily available at places with a large population, such as public venues like exhibition centres and concert halls. They should ideally be situated around cities, clearly signposted for ease of access. Also called supplementary first aid kits, these are an extra to those already required. New guidelines include recommendations on ‘supplementary kits’ as an extra resource to British standard compliant kits. The new range of BS8599-1 compliant first aid kits reflect what’s needed to deal with workplace incidents, and are more ‘fit for purpose’ in today’s working environments. You can order the kit by clicking Personal First Aid Kit.